Time for another Post It Note Tuesday. If you want to play too then go here: Visit SupahMommy. 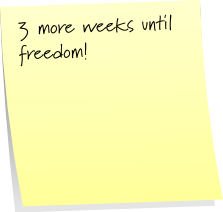 Go here to make your Post its: Superstickies. I'm all about the back to school shopping. I think this is what halloween would be like in my world. I, too like Phineas and Ferb... but if I have to see another iCarly episode, my head might explode!! I'd love to have you stop by my blog, Ten Talents, and check out the Low Entry Lowdown where I list different low entry giveaways (less than 100 entries) from several different blogs! You've got great chances of winning, and you can help out another blogger at the same time! Oh my goodness, I am ready to get rid of the TV shows, the theme songs are now constantly in my head. I hear Ya! 7 more days here and I am down to even counting those minutes! My pantry is bare, my fridge is empty, my house is trashed, and my TV is overheating from iCArly, Spongebob and Handy Manny! Newest follower here! Check out my blog when you get a chance. lol. It is amazing how much kids eat on school holidays! Great blog. I'm a new follower. New followers from Tuesday Tag Along. I have 1 week till partial freedom, one kid will go away during the day to school but the rest are doing online school and will still be here...rats!!! 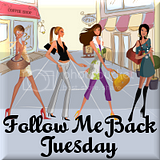 I am now following you thanks to Tuesday Tag-Along!It would be nice if you could share the love back on my blog ! Also if you need any help tweaking your blog or easy HTML tips, you know where to come! Plus today we have great SEO tips, so check it out! Happy Tuesday! Oh boy I remember those days! my Mom never wanted us to go back to school! I'm dying laughing because Phineas and Ferb and driving me crazy too!!! New follower here from Tuesday Tag Along. I don't have kids and I watch Phineas & Ferb...LOL!!! I watch Spongebob too...it's all good though! Hi! Just wanted to let you know that I am following you!!! I would love it if you could follow me back! I remember those desperate last few weeks. I'll raise you Degrasse (ok but I will admit it is pretty good) but with you iCarly, Hannah, and oh shoot, I must have tuned out the name of the other one..lol. Here in MI we passed a law starting last year to go back after Labor Day in order to try to squeeze out some more tourist $$. Somedays I am more glad than others that we don't have cable! Following from FMBT! Loving it so far! Come by and follow me back? Hi, I am following from the Tuesday blog hop! Good to meet ya. Liking you blog, I'll be back. Stopping by from Tuesday Tag Along. I was already following you but just wanted to give you a friendly reminder to feel free to stop by and join in my new blog hop: Wobble Over Wednesday. Love the post its! They sound like a cry for help!!! My kids started school 2 weeks ago and I've been living it up since! I'm on a blog hop and now your newest follower. Enter Hampton Chain of Friends Sweepstakes!